Perotis rara R. Br., Prod. 172. 1810. Veld. & Steenbergen, Austrobialeya 3(4): 609-614. 1992. Perotis macrantha Honda, Bot. Mag. Tokyo 41: 638. 1927; Taiwan Grass. 435. pl. 113. 1975; Hsu, Fl. Taiwan 5: 496. 1978. Culm tufted. Blade lanceolate, about 3 cm long by 4 mm wide; ligule about 0.2 mm long, minutely ciliate on upper margin. Inflorescence a single terminal raceme, about 9-10 cm long. Spikelets 1-flowered, 3.5-4 mm long; glumes lanceolate, hispid on backside, tipped with a long awn, 1-nerved; the lower glume about 3.5 mm long, excluding the long awns which are about 25 mm long; the upper glume of nearly the same length as the lower, tipped with a long awn of about 18 mm long; lemma lanceolate, hyaline, 1-nerved, acute, about 1.2 mm long; palea hyaline, 2-nerved, about 0.8 mm long, minutely ciliate at the apex. Caryopsis about 2 mm long; embryo 1/3 the length of the caryopsis. TAIPEI: Tanshui, Sasaki s. n. Nov. 13, 1924. TAINAN: Anpin, Yamazaki s. n. in 1923 (Type). 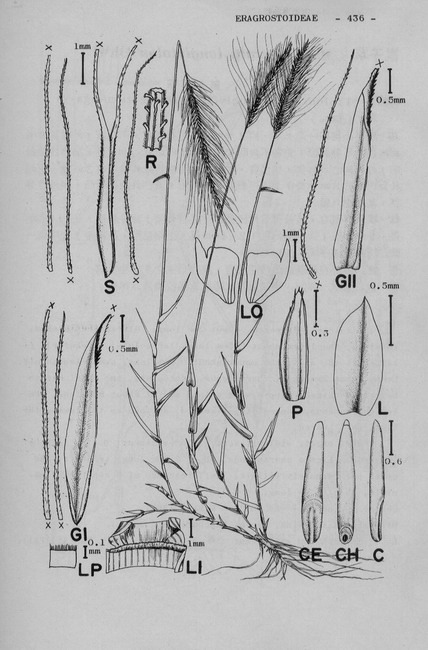 This species is probably the same as P. hordeiformis Nees which is characterized by its definite lines of hairs along the dorsal surface of the glumes.